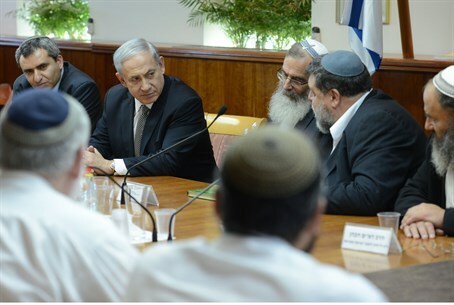 PM meets with Tzohar rabbis in mutual show of gratitude and support. Prime Minister Binyamin Netanyahu (Likud) met with rabbis from the Tzohar rabbinical organization Wednesday night, to thank them for their work during Operation Protective Edge. "We passed trying times," Netanyahu began. "An important part of this test was safeguarding the strength of the people and the great unity of the nation." "It is good to hear messages of strength from the leaders of the community supporting our activities [against terror - ed.] and steadfastness," he added. The Tzohar Rabbinical Association Co-Chair, Rabbi Rafi Feuerstein, also expressed appreciation. "The Tzohar organization's rabbinical staff want to express our appreciation for your leadership, and strengthen you at this time," he said. "We came here to pray for your success, to strengthen the security forces and the army," he continued. "Go with your strength and protect Israel' (Judges 6:14 - ed.) - this very simple statement says to me that the Creator of the Universe will give you strength." Tzohar, which works regularly with rabbis from around the world to protect the Jewish future of Israel, announced during the operation that they opened a special Operations Center to assist diaspora rabbis in all logistical and operational support to leading their communities to Israel during the war.